Boston — Sen. Adam G. Hinds, D-Pittsfield, has announced that the Massachusetts Senate Thursday unanimously passed S.2609, “An Act for the prevention and access to appropriate care and treatment of addiction,” often referred to as the CARE Act, by a vote 37-0. The legislation provides an additional set of tools to address the opioid crisis and establishes the Commonwealth as a national leader in the fight against this epidemic. 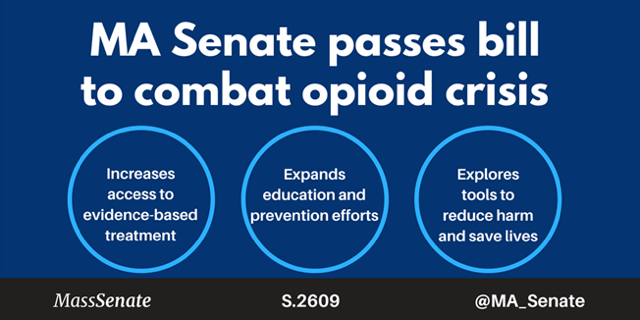 Among the provisions included in the bill are increasing access to medication-assisted treatment, exploring tools to reduce harm and save lives, expanding education and prevention efforts, and addressing the high rates of co-occurring conditions of substance use disorder and mental illness. Hinds is member of the Joint Committee on Mental Health, Substance Use and Recovery, the panel that reviewed and recommended favorable action on the bill in May. The CARE Act is the result of extensive work researching evidence-based best practices and collaborating with healthcare researchers and clinicians, hospitals, behavioral health providers, law enforcement officials, patient advocates, and individuals with lived experience to develop policies to address the opioid epidemic. Under the leadership of Hinds and Rep. Paul Mark, D-Peru, the Berkshire legislative delegation secured $150,000 in the fiscal year 2019 state budget to support opioid abuse prevention and treatment services in the Berkshires through the Berkshire Opioid Abuse Prevention Collaborative, a partnership among the Berkshire County Sheriff’s Office, the Berkshire Regional Planning Commission, the Northern Berkshire Community Coalition and Railroad Street Youth Project. Under this bill, someone who receives treatment in an emergency department for an opioid overdose will have the opportunity to begin treatment for their substance use disorder before they leave. The bill requires that all emergency departments and all satellite emergency facilities have the capacity to initiate voluntary treatment, including opioid agonist treatment, after treatment for overdose. The person will also receive a direct referral from the department to a provider in the community who can continue their treatment regimen after they return home. Under the legislation, the Department of Public Health is directed to issue a statewide standing order authorizing every pharmacy in the state to dispense naloxone, sold under the trade name of Narcan, eliminating the current requirement that each pharmacy obtain an individual authorization. The bill also brings Massachusetts in line with other states by providing liability protections, including protection from criminal or civil liability, for practitioners who prescribe and pharmacists who dispense naloxone in good faith. The bill makes significant strides toward extending access to medication-assisted treatment in correctional facilities, as well as including several provisions to address dual diagnosis and the high rates of co-occurring substance use disorder and mental illness in the Commonwealth. To ensure that the right kind of treatment facilities will be available to serve every patient who needs treatment, the bill enhances the oversight authority of the Department of Mental Health and the DPH’s Bureau of Substance Addiction Services. In addition, the bill recognizes the role that recovery coaches and peer specialists play in successful long-term addiction and mental illness treatment by creating two commissions to recommend standards for establishing a professional credentials. The bill also creates a Substance Use Prevention, Education and Screening Trust Fund that will help finance the expansion of school-based programs that educate young people on alcohol and substance misuse, and that identify and support children and young persons at risk of alcohol or substance misuse. The bill creates a special commission to study the feasibility of establishing supervised injection sites in Massachusetts. To reduce fraud and drug diversion and improve tracking and data collection, the bill requires that all prescribers convert to electronic prescriptions for all controlled substance prescriptions by 2020. The bill also updates the state’s partial fill law by clarifying that any patient who decides to partially fill a prescription for a Schedule II controlled substance will not have to pay a duplicate co-pay at the pharmacy if they decide to fill the remainder of the prescription later. The bill now returns to the House of Representatives. The House passed its version of the bill, H.4742, July 11th with a vote of 147–0.